1. Add the bookmarklet to your Bookmarks Bar (You can get it from here). If your Bookmarks Bar doesn’t show on Chrome browser, make Bookmarks Bar Visible in the browser. Use Chrome menu on the browser toolbar. For Mac OS X: Go to the menu: Select “View” > and then select “Always Show Bookmarks Bar”. This link is available inside, if you press the “Download” button. Then press the bookmarklet to continue. 82 Comments on "How to download Dailymotion videos using the bookmarklet in Chrome browser (desktop)"
3. Then, press the bookmarklet to continue. I submitted an issue but never received a response. I will try here. When downloading a video on Firefox, everything works fine. However, on Safari I can only get as far as right clicking on the quality of the video, selecting “Download Linked File As…”. Again, it works fine in Firefox but not in Safari. Please help. Thank you for your message. Sorry for late reply. It seems that you use private mode (Private Browsing) in Safari browser. If so, try to turn off the private mode (Private Browsing) in Safari, and then try again. Firefox browser has the same issue when using a private browser mode. You can also try to clear “Сache” and “Сookies” in Safari browser and then try again. I am not using Private Browsing in Safari. I have turned off all browser extensions in Safari, restarted Safari and it still doesn’t work. The “Сache” and “Сookies” in Safari browser have been cleared, as well. So far, it only works in my Firefox browser, which by the way, has all extensions on, and still works fine. Have you tried to playback a video file (Copied direct link) directly within Safari browser tab/window instead of using “Download Linked File As…”? If you can watch a video via the copied direct link within Safari browser tab/window – you can try to use the context menu and select the “Download Video As…”. I had already tried using the direct link as well, and “Download Video As…” which gives a “.m3u8” extension instead of an .mp4, but this also results in the same error message of: “Zero KB of ? – You do not have permission to access the…”, and it wont download. Nothing seems to work in Safari to get it to download the video file. I just tried using “savevideo.me” on the Vimeo website for a video there. 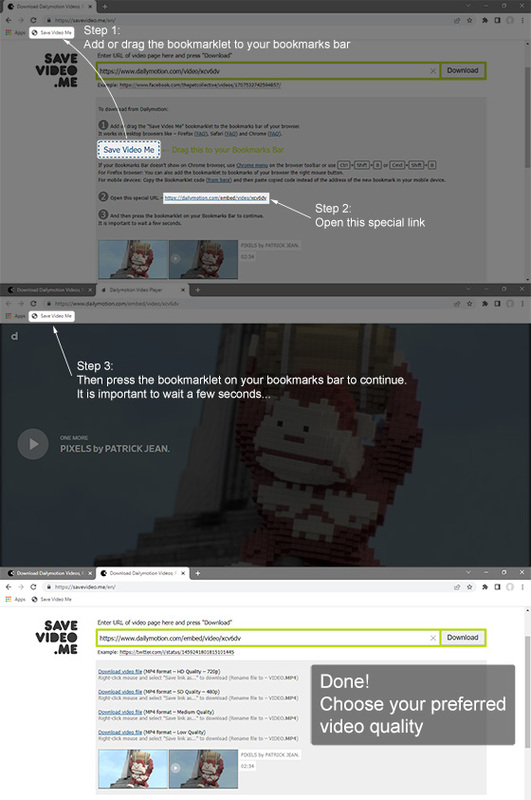 The bookmarklet doesn’t work (clicking on it does not open a new window), but if I enter the URL where the video is into the savevideo.me website, I am able to save the video. So it seems that the savevideo.me function is broken for dailymotion videos on Safari, but not on Firefox. Could you please share DM page URL (here or via feedback form)? Have you tried to log in your DM account and then repeat all the steps? >> I just tried using “savevideo.me” on the Vimeo website for a video there. I have been logged in to my DM account the entire time. Unfortunately, the issue is still not identified for Safari. But if it works fine in “Firefox” – you can use “Firefox” or any other web browser (while the issue exists for “Safari”). Also you can try to use HTTPS:// version of the DM website. I was able to download my first video and as MP4 file following the instructions. However, tried to download other videos, including the first video, for all the download options offered, they all downloads as the same .m3u8 file now, and the file is a small less than 1MB file that is not a valid media file. Any idea what’s going on? TIA! I still have not received an update on why Safari is not fixed. rjb, Do you have the same error when you try to download from another video site (e.g. from “Vimeo”) via “Safari” browser? Have you tried to use any browser extension, such as download manager or something for “Safari”? I do not have any error when downloading on Vimeo via Safari. I do not have any download managers in my extensions, either. Also, on Dailymotion (using Firefox), up to recently, I was downloading a video series from a particular user’s channel with no problems. But now, the most recent videos start to download for a few minutes then suddenly stop with a “Failed” message in the downloads progress window. It is not happening with other user channels, though. rjb, Thank you for additional information. Unfortunately, it is impossible to trace the reason why video is not available on the third-party server, where a video is stored. As for the second issue (error with long DM video) it does not dependent on SAVEVIDEO.ME for the same reasons. SAVEVIDEO.ME mainly helps to download “short videos” (simple videos up to ~10 min.). You can try to use any browser extension for managing your downloads that will help resume the download when the download immediately stops. able to down load from twitter to computer why is it that some downloads I get video and sound, but on some I just get sound but no video. Could you please share Tweet URL which has this issue? it’s beautifully done, easy and quick, thanks! hi, if i have the url to an old dailymotion video from 2013 that got taken down, can i use this to download it and view it? ive tried archive and ive managed to pull up the page the video is in, but cant play the video itself, is there any possible way to get it from the full url i have or is it lost forever? Could you please share page URL which has this issue? could u help me please? what must I do? It seems like you are using the “httpS://” version of the DM website. 1. Try to use “http://” DM site version instead of “httpS://” (Screenshot – http://prntscr.com/fduv79 ). 2. Or press the icon (shield with a red square) in the upper-right corner of the browser. Next, click “Load unsafe scripts”. And try again (Screenshot – http://prntscr.com/fduwju ). Is it possible that is a limit for the mb of the videos? Cause all the videos aren’t completed, I note that the best one have a half. Short videos (Simple videos up to ~10 min.) is downloaded fine. SAVEVIDEO.ME mainly helps to download “short videos” (Up to ~10 min.). It seems savevideo.me doesn’t work on DaillyMotion anymore, because DaillyMotion changed their video streaming way. I’m using Developer Tools, and see the mp4 video is separated around 100 Kb per clip delivering via xhr. Hi Ben! Thank you for your comment. SAVEVIDEO.ME is still works with DM videos. If downloading stops, then just copy the found direct link (Link to a video file) and open it in a new browser tab/window (manually). It seems that the issue is only when a link to a video file was opened from the SAVEVIDEO.ME interface. Previously, savevideome.com works, but now get 403 Forbidden. I’ve downloaded it successfully, however, the download method is changed! 4. On the streaming video, right-click the mouse, and choose `save the video`, then the download started. Currently the issue is fixed for “new web browsers” only (Chrome > v.15, Firefox > v.36, Safari > v.4, Opera > v.12).